The Bosphorus Bridge, also called the First Bosphorus Bridge or simply the First Bridge is one of two suspension bridges spanning the Bosphorus strait in Istanbul, Turkey; thus connecting Europe and Asia (the other one is the Fatih Sultan Mehmet Bridge, which is called the Second Bosphorus Bridge.) 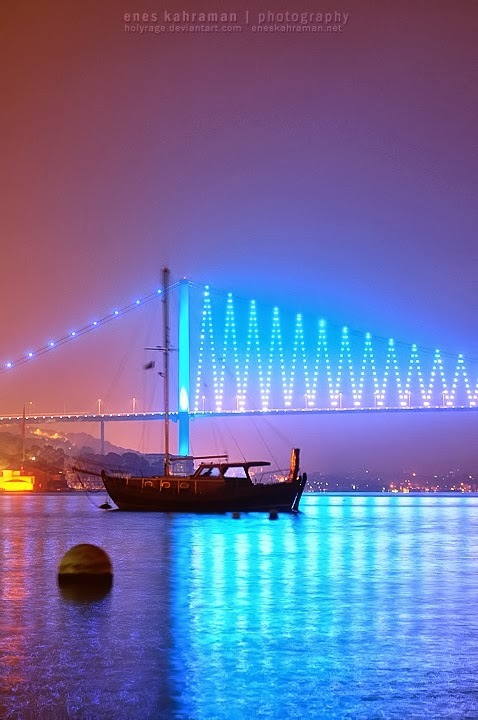 The bridge is located between Ortaköy (on the European side) and Beylerbeyi (on the Asian side). It is a gravity anchored suspension bridge with steel towers and inclined hangers. The aerodynamic deck hangs on zigzag steel cables. It is 1,560 m (5,118 ft) long with a deck width of 33.40 m (110 ft). The distance between the towers (main span) is 1,074 m (3,524 ft) and the total height of the towers is 165 m (541 ft). The clearance of the bridge from sea level is 64 m (210 ft).